Borderlinx | Buy Sports Direct and ship worldwide with Borderlinx. Cheap rates guaranteed. A leading British sports retailer, Sports Direct carries a large number of big sport, fashion and lifestyle brands offering an incredible choice of football boots, running shoes, football kits, fitness clothing and much more. Thanks to its extensive online catalogue, Sports Direct has a diverse product line that will assist you to train and improve in your chosen sport or activity. 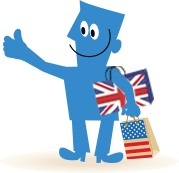 Now with Borderlinx, international customers can order from Sports Direct in the UK, and Borderlinx will ship your apparel order cheap right to your doorstep! With Borderlinx, shipping, tax & duties are estimated upfront with our Shipping cost calculator, and services such as concierge, free repacking and consolidation services available to make international ordering from Sports Direct hassle-free!